I just finished Firewatch and I wanted to share my five favorite lessons for tabletop game designers. The following five points are not appropriate for all games, but might be interesting considerations for your next design. Firewatch offers a soul crushing introduction akin to Pixar’s Up right off the bat with primarily just text. This tints the entire story with a contemplative and emotional tone. Much better to start strong than build into theme. In a board game, introducing story is a bit more difficult. Some possible ideas include descriptions on character cards and lore in the manual. These are problematic though because they are easy to ignore. What about story choices that change the initial setup, or story elements that make the game play pivot a certain direction at the midpoint? It’s not novel to give players choices in video games. Some of my favorite games like Mass Effect 2, offer gigantic galaxy saving choices. Little choices, on the other hand, are more uncommon. Firewatch does something different by offering players thematic but inconsequential choices. Simple things, like picking from three different dialogue options on the radio or not responding at all, create a interesting sense of autonomy. As board game designers, how can we give players choices outside of the base mechanics of a game? Some options include: letting players pick their character’s gender, appearance, or thematically related special ability. How about players collecting items just for the heck of it? An extension of point two, one of my favorite scenes in Firewatch is near the end. Your character is asked to pack up your belongings as you evacuate the watchtower. The twist is that we get to pick what which items we take. I made the choice to take a photo of Julia and I also put my wedding ring back on. This choice offered no change game play (I think), but really allowed me to inhabit the character in an important narrative beat that was made by me. In a board game, forced role play can be really awful. Very few people want rules that make you yell like an orc (I’m looking at you Age of Sigmar). That being said, creating game play that evokes theme really allows for players to inhabit their characters. I intimately feel the danger playing the Rebel Alliance in Star Wars Rebellion due to the hidden rebel base mechanism. In Firewatch, I’m mainly thinking about the character Delilah here. If you haven’t played, she sits on the other side of the canyon talking to you from a radio. I don’t think the developers did a perfect job, because sometimes I felt a bit railroaded into certain conversation responses, but I genuinely went from hoping a budding romance would develop between Delilah and me, to thinking she was pretty unprofessional and selfish. In the end I sat somewhere in the middle. In the tabletop world, I think New Angeles and Gloomhaven do a cool job of adding ambiguity to their experiences. In so many games I find myself play as a white-as-snow piece of wonder-bread adventurer, but in Gloomhaven many of the characters represent the ethically questionable dregs of society. In New Angeles you play as an evil super-corp! Through the course of the Firewatch only two or three game play mechanisms are added. Each new feature adds very little complexity but unlocks new areas or moves the story forward. For Firewatch, this works because the focus is on the scenery, the characters, and the developing mystery. In game design, a real benefit to having an enriching story is the ability to decrease complexity while also increasing player investment (if your story is good enough). 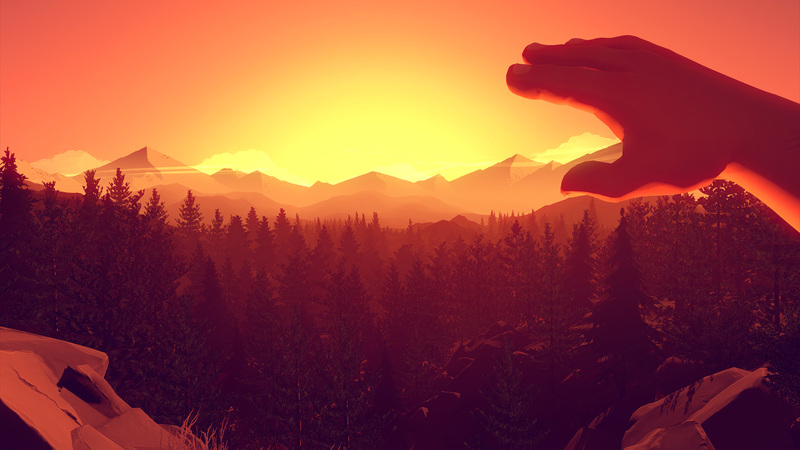 Firewatch, underneath it all, is just a walking simulator. I believe that a lot of the complexity and innovation of the last five years in board game design is probably unneeded for a game that can create an engaging narrative experience. Give the story space to steal the show. That’s all I have for now. If you like this type of post let me know and I will try to write more about indie video games and how game design choices might be brought into the tabletop design space.